Did you know that many of the special operations and dangerous missions US Navy SEALS complete might not be possible without the help of specially trained and specially outfitted - four-legged SEALS? Not only do these amazing dogs sniff out bombs, track human targets, and even parachute from planes into enemy territory, they also save the lives of US servicemen and women by alerting them to hidden dangers. Military dogs come in all breeds, shapes, and sizes. From a 15lb West Highland Terrier trained to travel through tiny air ducts, to a 250lb Saint Bernard and every size in between, these hero dogs are outfitted is some really cool custom gear, like the vests made by K9 Storm. At a cost of $20,000-$30,000, K9 Storm’s “Intruder” vest is bulletproof, waterproof, high-tech, and ultra-lightweight. The vests are bulletproof, able to stop even a 9mm or .45 round from a handgun. 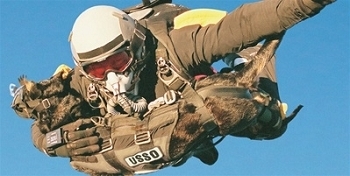 And, because Navy SEALS operate from air, land, or sea, the vests are waterproof, make use of Kevlar hooks & D-rings for parachuting, repelling, and lifting, and are custom fitted to each dog for maximum mobility. In addition to protecting the dogs from attack, these vests feature high definition video cameras with night vision and transmission enable a receiver to operate at a safe distance, even through solid concrete walls and steel ship’s hulls. The handler can see where his dog is going, see what he is seeing, and even voice audible commands to his service dog. The entire unit weighs just between 3-7lbs, depending on the size of the dog and added accessories. K9 Storm, founded by Jim Slater, a former police dog trainer developed the vests after noticing during a prison riot - that while he was protected, his K9 was completely unprotected - to help protect the dogs that protect us.